PPL Electric’s, once known as Pennsylvania Power & Light, roots are fixed firmly in its home of Allentown, the onetime industrial powerhouse of Pennsylvania. Though the region’s manufacturing base has declined somewhat in recent years, PPL provided the power behind one of the most critical industrial regions of the American Northeast. Pennsylvania Power & Light began as a conglomeration of 62 different power plants in the eastern part of the state along with eight regional utility companies. Though the combination led to a complex system of parent companies and holding companies, the resulting utility lasted largely unchanged until the beginning of electricity deregulation in 1998. Soon after this the company moved quickly to purchase Montana Power. Several years later it also acquired E.ON, the British parent company to two major Kentucky utilities as well as some local companies. Over 1.4 Million million homes and businesses in Pennsylvania have their electricity delivered by PPL. Lehigh Region encompasses Allentown and nearby Bethlehem, where PPL got its start. Susquehanna Region stretches from Berwick past Williamsport. Harrisburg Region includes the capital and its surroundings to the northwest. 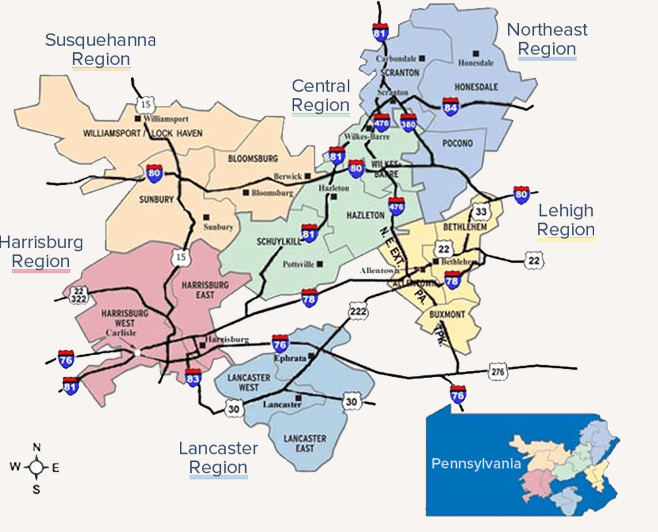 Lancaster Region largely encompasses Lancaster Country itself. Central and Northeast Regions cover much of the space in between and northeast to the state border with New York, from Pottsville to Scranton and Honesdale. In all, PPL’s service area covers 1.4 million across 29 counties in Pennsylvania. PPL also serves around 1 million customers scattered across much of Kentucky and 2.6 million in the U.K., largely in Wales. When PPL customers don’t switch their electricity provider, the delivery and the supply of their electricity is done by PPL Electric. With Pennsylvania electric choice and electricity deregulation in full effect, PPL customers now have the right to choose their own PPL electricity provider. On the right side of the screen you will find a free compare and switch tool which will allow you to choose from a number of PPL electricity providers. Just enter your zip code, click search and start comparing electricity providers. Be sure to have your most recent PPL Electric bill on hand for your account information and to compare your current supply rate with what is being offered by providers. Once you make the switch, their is no need to contact PPL directly. The provider will contact PPL and you should see your new electricity supply rate on your bill in 1-2 billing cycles.